Stamped steel flat plate or "rear-set". The stock pegs that come with the GS500 are chunky, heavy, and utilitarian (not sporty). This setup can be improved/lightened considerably by purchasing aftermarket rearsets or modifying another bike's to fit. 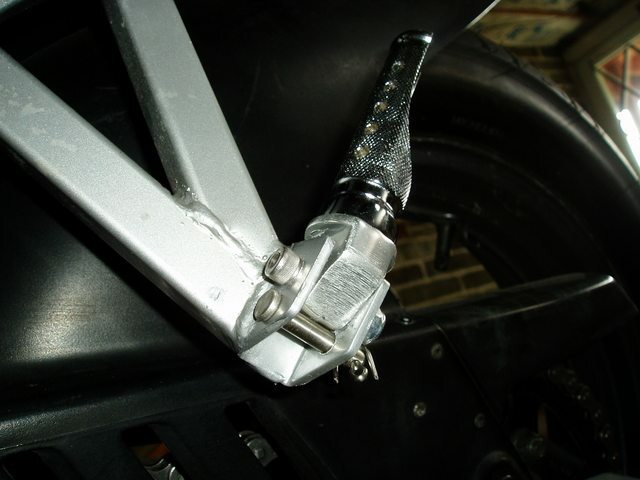 The mounting gap for pegs on our GS's is 17mm and the mounting holes and pins are 1/4" diameter. There are also different colors! I have found a set for another bike that are very cheap, easy to modify to suit and look great/perform well. They are turned aluminium and available in a variety of anodized colours. 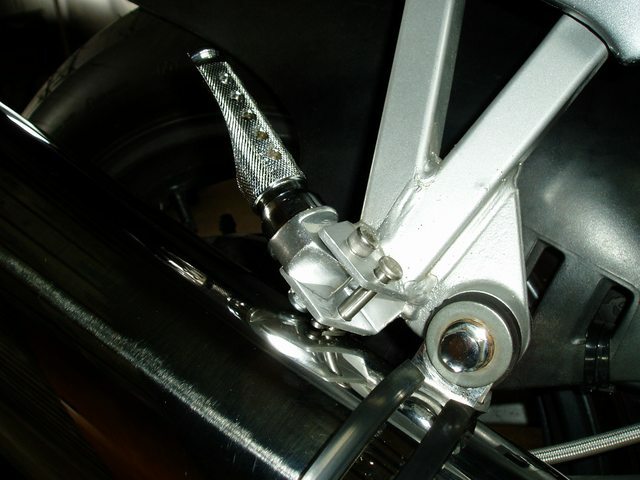 If you search on eBay for GSXR600 750 TL 1000 - REAR FOOT PEGS you should be able to find them. AGAIN, it is very important you get REAR pegs (ie passenger pegs) for this mod... front pegs will not fit. We will be modifying these pegs to become riders pegs. The flat face of the peg hinge (ie not the angled surface) needs grinding. You can install the pegs into the peg-hangers (angled surface upper-most) without doing this and you will see that they do not sit horizontal. There is a small hump on the non-angled side of the peg hinge that is preventing them from going fully down - this you want to remove (picture: below-left). Basically you grind the surface flat by 1-2mm until it looks like the picture below (right). This is easily done with an angle grinder and the peg in a vice. Test fit the pegs by inserting them with the angled surface facing upwards, using the bolt and e-clip used on the stock pegs. As the peg hinges are slightly narrower than the stock ones you will need to put a washer on either side of the hinge (ie 2 for each peg), but inside the hanger bracket (see pictures above and below). Slip in the bolt and push on the e-clip to secure. The stock pegs rely on a metal washer compressing against the rubber of the pegs to provide the flip-up-flip-down action. These pegs will flip up if you ground them on a corner, but the movement is limited by the upper corner of the sides of the peg bracket slot (because aluminium doesnt compress like rubber!). If you were inclined you could round this off with the angle-grinder, but the movement even without this alteration is more than enough for some pretty spirited riding. I really like the way they feel over the rubber of the stock pegs - they catch the heel of your boot better and feel nice underfoot. They are much thinner too which means that you have slightly more leg room (about an inch), but you will probably need to adjust your foot brake lever due to this change. 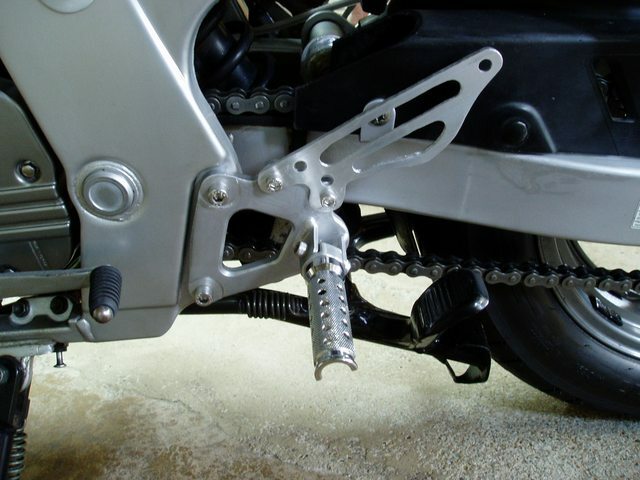 Thanks to forum member 'galahs' we now have a solution for matching rear pegs. Now they needed a touch of modifying to get them to work as rear pegs. The peg when rotated forward wont stop in position and want s to keep rotating forward. It needs a stopper put in place. 4. mark the pegs location. ADDITIONAL NOTES (Showbizwolf): This thread has some additional peg information that I found very helpful: http://gstwins.com/gsboard/index.php?topic=63109.0 BECAUSE, it explains why these 2-part eBay pegs work well. The mount is actually separate from the peg. By loosening the allen screw that attaches the peg to the mount, you can rotate the peg portion until it's correctly positioned and then tighten it down. ALSO, 3/16" washers did not work for me... they were too small to fit over my stock peg pins. My stock peg pins measure about 1/4" diameter. I ended up buying some M6 washers and also some #12 washers instead. I did not re-use the stock peg pins for the aftermarket peg install. I bought (4) 1/4" x 1 1/4" stainless allen bolts and some nylon lock nuts and used those. I liked that by using this method, I could tighten the peg in the bracket. Not so tight that they won't move but tight enough so they don't vibrate or flop around. 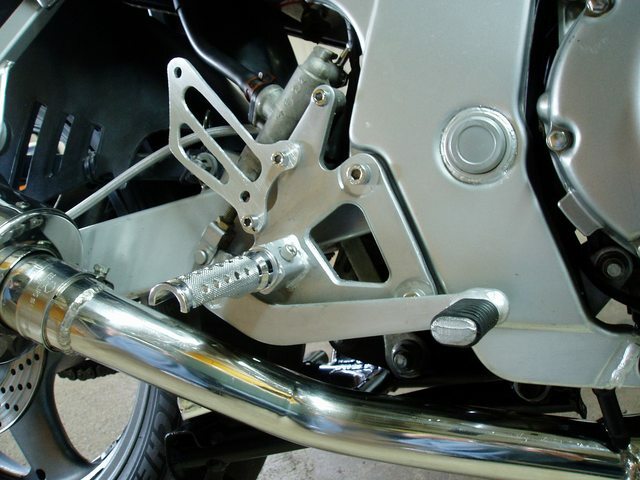 When I installed the passenger pegs, I did not use a split pin/cotter pin. I drilled a 1/4" hole and re-used the stock peg pins instead. Then I ended up selling my stock pegs and those pins so I bought (2) 1/4" x 1 1/4" stainless clevis pins and some 3/32" stainless cotter pins and used those to stop the passenger pegs from folding down farther.